This unique print will make a fun and quirky birthday gift for a child who hopes to become a future genius. It shows a boy inventor, stood in front of his latest robot design, working on his next amazing invention. ‘When I grow up I want to a genius’ is printed in purple text on a white background. The print is available in A4 unframed, A4 framed and A3 unframed. This print is available in three variations; A4 unframed, A4 framed and A3 unframed. The product image shows the A4 framed print. If you choose the A4 framed print, the frame measures 235mm x 325mm and has a beautiful oak finish as shown in the photo. It can be hung on a wall but also has a stand on the back so it can be stood on a flat surface. Please note, the A4 framed print is available for UK delivery only. When purchased without a frame, the A4 print will be supplied in a cello bag with a rigid piece of cardboard. The A3 print will be protected with tissue paper, carefully rolled up and placed in a tube. The prints will fit in any widely available A4 or A3 frame. 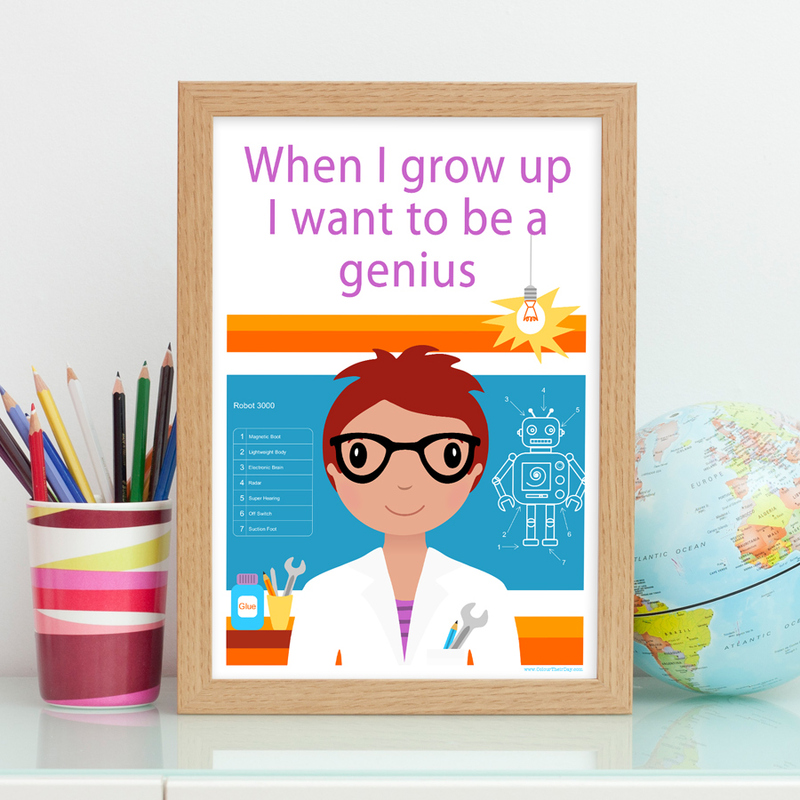 Be the first to review “I Want To Be A Genius – Boy A4 / A3 Print” Click here to cancel reply.